MORRISON, Colo. — Matt Hagan isn’t the first standout driver to have his share of struggles at Bandimere Speedway, where the altitude and racing at an elevation of more than 5,800 feet can throw a monkey wrench into even the best laid plans. 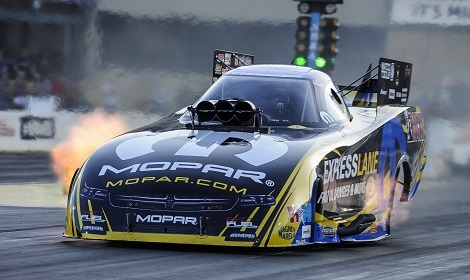 But with one of Hagan’s main sponsors again the title name for this weekend’s 38th annual Mopar Mile-High NHRA Nationals at Bandimere Speedway, the two-time world champion would like nothing more than to claim his first win on the mountain. A top performance at Bandimere has eluded Hagan thus far in his 10,000-horsepower Mopar Express Lane/Rocky Boots Dodge Charger R/T, but the 20-time national event winner hopes a strong string of performances during the 2016 NHRA Mello Yello Drag Racing Series season will yield positive results at the first race of the famed Western Swing. Sunday’s finals will be broadcast live on the FOX national broadcast network for the first time in NHRA history, giving Hagan even more incentive to perform at a high level at Bandimere Speedway. The event also means a full slate of promotional activities, meaning Hagan must come prepared and stay that way throughout the weekend in the high altitude. After early struggles that led to first-round losses in three of the first four races this season, Hagan and his team, led by crew chief Dickie Venables, have rounded into championship form. Hagan has picked up two wins and three final round appearances in this current nine-race stretch, falling just once in the opening round. He was the No. 1 qualifier at the most recent race in Chicago with a blistering 3.882 at 331.12 mph, moving closer to a peak performance Hagan hopes is there during the Mello Yello Countdown to the Championship. Only four events follow the Mopar Mile-High NHRA Nationals before the six-race playoffs and Hagan likes the direction his team is headed. Hagan hopes the next victory comes in Denver, but a host of stars await at Bandimere Speedway, including Don Schumacher Racing teammates Ron Capps, who has four wins and the points lead, defending event winner Beckman, who won in Chicago, and Tommy Johnson Jr.
Other class standouts include six-time Denver winner John Force, Robert Hight, a three-time event winner, Courtney Force, Alexis DeJoria, reigning world champion Del Worsham and Tim Wilkerson, who has two wins in 2016. But Hagan, who made his only final-round appearance in Denver in 2011, is as confident as he has ever been heading to Bandimere Speedway. He qualified sixth and won a round at the race a year ago before falling to Beckman, and Hagan believes his team can build off of that heading into this year’s Western Swing kickoff.